A translucent veil of humidity cloaked an expansive, almost serpentine assemblage of immaculately manicured young club goers, who lined the sidewalks of Miami Beach’s Washington Avenue, rank-and-file, oblivious to the billowing clouds that churned overhead; instead transfixing their volitions on dancing the night away at the biggest party on South Beach, as world-renowned trance DJ/producer, Gareth Emery, prepared to unfurl his epically-scaled sounds on a capacity crowd. 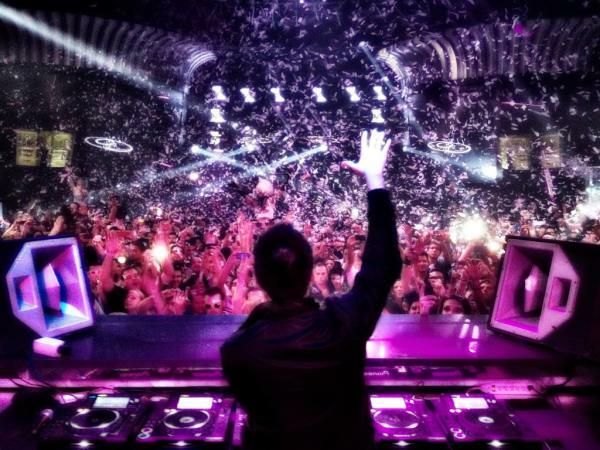 Emery returned to Miami, this time at Mansion Night Club, in the wake of his remarkable performance at this year’s installment of Ultra Music Festival, where he dropped the second-to-last set at Armin Van Buuren’s A State of Trance 550 tent. Emery has ushered the otherwise stagnant trance genre into a new era, ameliorating its diminished viability from a commercial perspective with innovative sets that incorporate a multitudinous array of soundscapes that transcend the limitations that become problematic for an artist who chooses to stick to one particular end of the spectrum. It is this reluctance to adhere to any one particular set of conventions, to continue innovating and playing what is compelling above all else, that makes Gareth Emery arguably one of the most talented, but inarguably the most underrated, figure in contemporary trance. It is this versatility that became the determinant that lent to the unfettered power with which Emery wove an assortment of tracks into a stunning two hour composition that attained orchestral proportions, integrating elements of trance, electro and mainstream house into a cogent whole. Flaming bottles of champagne were carried triumphantly into the sizable VIP areas that adjoined the elevated stage, as Emery manipulated tracks with the poise and confidence of a masterful tactician, as the lights that adorned every conceivable expanse of the ceiling shimmered with rapid resplendency, running in shimmering circles through the perimeter of the spacious main room, showering everything in sight with bright, alternating fractals. The massive LED screens flanked either end of the dance floor, projecting images that melded cohesively with the lights, melting the notion of an outside world to being nothing more than some illusory concept that was irrelevant as the beats pulsated, contorting to every whim of the man at the decks. Emery dexterously sojourned through myriad soundscapes that peaked in ascendant glory, at times slowed to meditative tranquility and throbbed with distorted flourishes of synth. The track selection was brilliant and seemed genuinely reflective not only of the venue and the ambience, but also of Emery’s own sonic palette. He mashed up his masterful original release “Concrete Angel” with Hardwell’s club smash, “Spaceman,” resulting in a towering concoction of electro and trance that proved to the hallmark of the evening. While there were instances in which the densely-layered synthesizers and ethereal female vocals that are essentially synonymous with trance became prevalent – they seemed to come at the most opportune moments, when it had all just become too intense to continue jumping and flailing spasmodically; one could call it a respite of sorts. Emery’s strongest tracks, “Tokyo,” and the aptly-named “Mansion” made a prominent appearance in the performance, somehow figuring in perfectly with more well-known tracks such as Avicii’s “Silhouettes,” Nero’s “Promises,” and Swedish House Mafia’s “Greyhound.” It was the sort of balancing act that perfectly showcased the strengths of his own catalog, while perfectly playing to the tastes of the audience. The cohesiveness that resulted from his prodigious abilities as a mixer was ultimately what served to emphasize the fanfare with which he was greeted with in the first place. Gareth Emery is, by all means, a tremendous talent on the cusp of widespread recognition. Leave a Reply to Viceroy J.